In a large saucepot, melt butter and combine with flour to make a roux. Add onions, celery, pepper, and garlic to roux and cook until onions are translucent. Add tomato purée, bay leaves, and stock (if you do not have stock, water can substitute) bring to a simmer and cook for 20 minutes, or until you cannot taste the flour anymore. Add herbs, cayenne, diced potato, and crawfish, cook for 5 more minutes on medium heat. 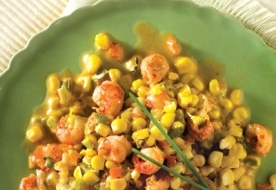 Recipe and photo courtesy of Louisiana Seafood.